Class is limited to 12 students. Judy Pekelsma is an instructor at UNM and is currently working on her Masters Degree. She spent time learning from a Navajo Weaver the traditions of Navajo weaving as well as actual Navajo technical skills. The class will begin with an introduction to the History of Navajo Weaving and the importance of weaving in the Navajo Tradition. You will learn to warp a loom, design a pattern, weave a small rug, remove from the loom and finish the project. Supplies for warping the loom (double ply warp, 3 ply side edge cord, dowels, heddle stick, clothesline rope.) 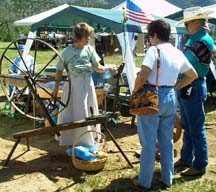 A loom will be provided for your use during the workshop. We may be able to provide sleeping areas for 3 or 4 people. You would need to bring sleeping bags, bedding, and towels. We have 2 twin air beds and 1 queen air bed. 2 baths are available. Breakfast and Lunch will be provided each day. Dinner will be provided on Friday evening. Other meals will be your responsibility. Capitan is 12 miles from Lincoln and Ruidoso is approximately 35 miles each way. Kitchen facilities may be available for those wishing to take advantage of the sleeping areas on site.